When I was growing up, my grandparents owned twenty-six acres of woodlands and marshes that were a haven for birds. My grandfather took long planks, forming Zen-like bridges which zig zagged through the wetlands, creating a trail to the Baker River where we would take long walks, exploring nature. The house is located in Plymouth, New Hampshire and used to be an old Stagecoach Inn. It has hand-hued beams in the ceiling and hand-forged iron latches on the doors. One side of the property borders a babbling brook where my brother and I used to love to play. The brook runs into a bog-like area forming marshes in the lower parts of the neighboring fields. A rustic stonewall marks the demarcation between our property and a 50 acre farm with its far-reaching fields that extends north to the river. In the early mornings I take a walk down the old dirt road to sit awhile on the little wooden bridge that stretches over a spot that funnels the wetland marsh waters back into a fast running brook. It’s only about a foot over the water and I can dangle my feet and watch many species of bird from this one spot. When I was a kid, my brother and I used to pretend this bridge was a floating raft. We imagined we were on some big adventure with snapping turtles, birds and the occasional grasshoppers that would jump aboard. This was also the place I saw my first Golden-crowned Kinglet. Today, to my delight, I saw not one, but a small group flitting through the lower branches looking for food on this beautiful June morning. Once you cross the bridge, on one side is a large woodland area. When my children were born the neighbors converted a few areas of the field into a Christmas tree farm, and planted a variety of conifers. Over the years many of the trees were not cut down and the grove became a forest— the perfect place for birds like the Golden-crowned Kinglet to locate themselves, and now they have flourish. Golden-crowned Kinglets are tiny, not much bigger than a hummingbird. They are a very social bird, and are not skittish of people. Outside of the breeding season they continue to flock with each other and can be seen with other small songbirds including some Warblers, Chickadees, Downy Woodpeckers and Red-Breasted Nuthatches. They flick their wings while hopping from branch to branch looking for insects. Their yummy diet includes aphids, grasshoppers, crickets, lice, bugs, lacewings, beetles, caddis flies, moths, butterflies, flies, bees, wasps, spiders, mites, and some mollusks. In winter the Kinglets also eat small amounts of seeds and may forage in brush piles and under trees. June begins their nesting season and they are alert, acrobatic and very busy. They raise two large broods of young despite the short season of the northern boreal forest. The female feeds her first brood up to the day after they leave the nest. She then starts laying the second set of eggs while the male takes care of the first brood. The male manages to feed eight or nine nestlings himself, and he occasionally feeds the incubating female too. -10° F, sometimes huddling together to keep warm. They are easy to identify: small, 3 1/4 to 4 1/4 inches long, with a black and white striped face, flashy yellow-orange crown patch outlined by a distinct black eyebrow stripe. Golden-crowned Kinglets are pale yellow-olive above and lighter below. A good look can require some patience, as they spend much of their time high up in dense needled foliage. But like all birds they need water and I am lucky to be able to watch them by our little bridge. 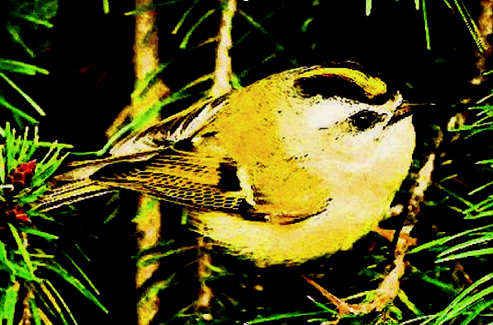 Golden-crowned Kinglets are numerous, although populations declined between 1966 and 2014, according to the North American Breeding Bird Survey. In the U.S., the species declined by over 2.5% per year during this time, resulting in an overall decline of 75%. They are not on the 2014 State of the Birds Watch List. Logging, forest fires, development and other disturbances have detrimental effects their habitat. I always considered the views from the main road picture perfect for any postcard or calendar of the area as the two properties have always been a refuge for wildlife and little birds like this one. Sadly, I fear it will be destroyed for development soon. This little paradise, postcard heaven, like so many in this area will be lost.